All materials needed to run Restarting groups and train facilitators are included under the Institutional Training (IT) license. The IT license package includes the full set of all Restarting program exercises, lectures and Immanuel process demonstration videos. Each of the 12 sessions is on its own DVD along with the facilitator training materials that apply to that specific lesson. There are 12 DVDs in the set. The Restarting IT license is required for anyone who runs a closed participation program. This includes schools and certification programs as well as both for profit and nonprofit service provider programs. Some examples include: institutions of higher education that grant degrees, training programs that grant certificates, professional treatment programs, and non-professional treatment programs. The IT license is a 2-year renewable license. Not only does the IT license entitle you to a 15% discount on Restarting workbooks but it also provides you with FREE updates or program improvements during the license period. We are committed to ongoing program development. We want your input on program implementation and in return provide licensees with any upgraded products. IT users are also given special opportunities to beta test the Thriving modules that are still under development. There is already strong anticipation based on the powerful results the Thriving methods are having during development. The theory behind Restarting is stellar, and reports we've received from many Restarting groups are very encouraging. However, since there are no established outcome studies at this time, we are interested in development partnerships with organizations that are willing to do outcome studies and price the license accordingly. FREE or reduced rate use is available for development partners who can provide reliable outcome measures for participants. The benefit for you may include leading the recovery field while we receive outcome verification. Even if you do not become a development partner, we are providing introductory incentives for those who act quickly. Further discounts are provided through our three-tier pricing policy. The 12 DVD IT License set contains all the material in the Restarting Open Group License 4 DVD set PLUS the material in the Facilitator Training 2 DVD set. Each DVD includes one lesson and all the Facilitator training videos for that lesson. 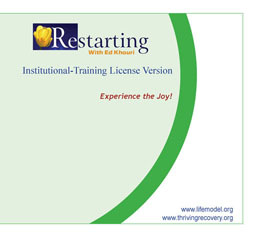 This format is suitable for training addiction counselors, facilitators and program volunteers. It provides easy-to-locate access for individual lessons or for running recovery groups. With an IT license you will always have the most current version of Restarting and the Restarting Facilitator training video. A current IT license covers the cost of any upgrades for Restarting videos that are released during that license period. The IT license entitles the holder to a 15% discount on all Restarting Workbooks along with bookstore discounts on the Restarting Home License DVD. These discounts soon let you save your license costs. The IT license offers deep discounts for non-professional groups and small service providers. The IT license offers special rates to development partners who provide outcome measures. The IT license provides opportunities to beta test Thriving modules that are still being developed. CLICK HERE to download our 16-page Restarting product catalog that includes the Institutional License application form.